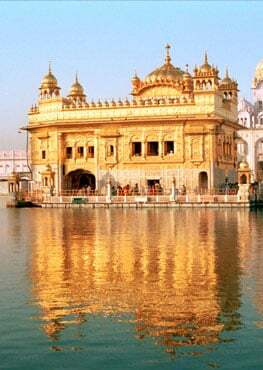 Indian Punjab is one of the tiniest States situated in the North-Western part of the country covering an area of 50,362 square kilometers which is just 1.53% of India's total geographical area. Though Punjab is considered the only homeland of the Sikhs having a majority population but the demographics of the State is changing fast. People professing the Sikh faith are 57.69% of the total Punjab population as per 2011 census records which is a sharp decline in the last couple of decades. This percentage is further likely to fall in the coming 2021 census. Hinduism stands at 38.49% of the total population, Christianity at 1.26%, Jainism at 0.16%, Buddhism at 0.12%, Others or not religious at 0.35%. In Punjab the fastest growing religion is Islam. Just few decades back, Muslims in Punjab were very few in numbers but today they form a staggering 1.93% of the Punjab's population and are likely to increase sharply in the 2021 census. The hub of the Islamic activities in Punjab is the city of Malerkotla(Muslim majority) in Sangrur district with Muslims comprising 68.50%, Hindus comprising 20.70%, while Sikhs at mere 9.50%, others comprise 1.30%. 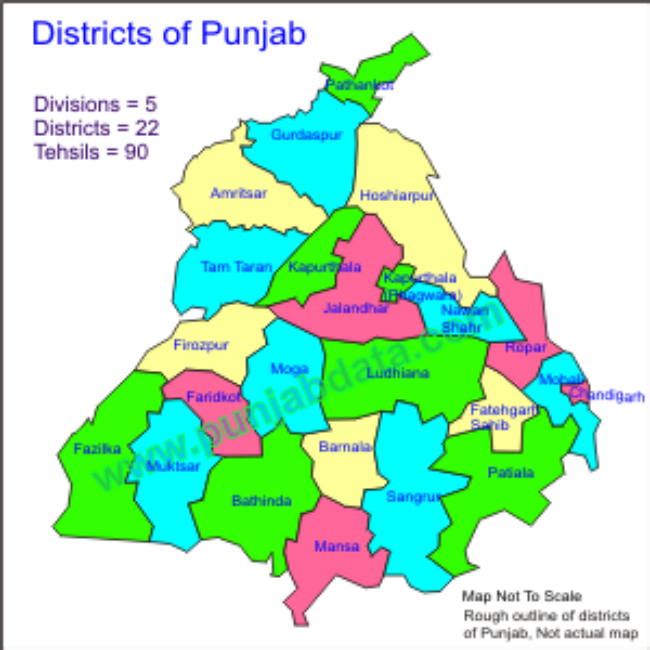 There are total 22 districts in Punjab. Sikhs are declining and they comprise of majority in 18 districts while in 4 districts Hindus are in majority. 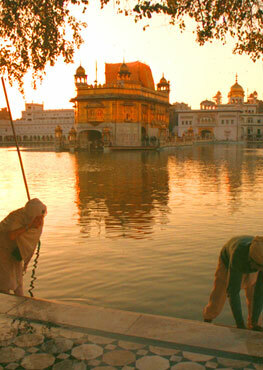 So, the question arises here is as to why the number of Sikhs are declining in Punjab. If the present trend continues then in the next 50 years Punjab will slip out of the Punjabi Sikhs and they will turn into minority. Due to large scale migration of Sikhs abroad since the 70's. Agriculture is no more a profitable business to do in Punjab and there are no heavy industries where one can find jobs, there existed few small scale industries but due to the militancy that effected the State in the 80's and the 90's these small scale industries have shifted their base to the neighboring States of Haryana and Himachal Pradesh. So, Punjabi Sikh youth has no other option left except migrating. Due to slow growth rate of Sikhs. Sikhs have a very poor growth rate or the birth rate. Muslims and Hindus are growing at a very fast rate and almost likely to outnumber the Sikhs in Punjab in the coming decades. Due to Apostasy. There is a sharp increase of apostasy amongst the Punjabi Sikhs. Majority of the Sikh youths in Punjab have shunned their outer identity and they are more into drugs and alcohol. Punjabi Sikh youths' main aim in life is to migrate abroad looking for greener pastures. Sikh females marrying non-Sikh men. Increasing number of Sikh women prefer marrying non-Sikh men. Each year number of cases are reported where young Sikh females marry outside their faith be it with Muslims, Hindus and Christians. One such case that was widely reported in the media last year was the case of a Sikh woman named Kiran Bala, a resident of Garhshankar in Hoshiarpur district in Indian Punjab who was on a pilgrimage tour to Pakistan along with the Jatha. Upon reaching Lahore, she eloped with a Punjabi Muslim man and converted to Islam. She emerged in front of the Pakistani media wearing Hijab (Muslim attire) amidst cheering of the Punjabi Muslim crowd and announced that she is now married to a Punjabi Muslim man named Mohammed Azam and has embraced Islam, her new name is Amna Bibi. It was a proud moment for the entire Punjabi Muslims as their own Lahori boy succeeded in converting a Sikhni to Islam. A month later, Mohammed Azam declared that his wife has started learning to read the Quran and has been fasting in Ramazan and it's giving her spiritual relief. He added that she prepares sehri and iftari for herself and his family members passionately. Kiran Bala (Amna Bibi's) case is not the only one. In the last few decades in the Kashmir Valley, hundreds of cases have been reported where Punjabi Sikh girls of the Valley marrying Kashmiri Muslim boys and their subsequent conversion to Islam. Not only common people but even many Sikh female celebrities prefer marrying non-Sikh men. In the Bollywood industry, media, politics, television there is a long list of Sikh females married to non-Sikh men. Marriages are the most easiest way to convert Sikh girls to non-Sikh faiths. Once, a Sikh girl is married into a non-Sikh household, she is bound to follow the non-Sikh traditions and then the babies born are raised as per the non-Sikh practices. Not Proselytizing Sikhism. Since there is absolutely zero proselytization of Sikhi, so there are no new converts to Sikhi but there are many cases where Sikhs have converted to non-Sikh faiths. Thousands of Chamars or the Bhangi Sikhs have converted to non-Sikh faiths in Punjab. Lebanon, the country in the Middle East was once Christian dominated. Christians in the year 1932 comprised 51% of the total population, rest 49% comprised of people of various religious affiliations Muslims, Druze, etc. Lebanese Christians were quite liberal like the Sikhs and were tolerant, secular, believed in the principles of brotherhood, inclusiveness of all, etc. and were not into proselytization of Christianity but on the other hand, Muslims were involved in proselytization of Islam. This led to high increase of the Muslim population and by 1985, Christians were reduced to just 25% of the total Lebanese population. Christians lost almost all of their political and religious rights and were reduced to second class citizens in their own motherland. That was the time when Christians realized their mistake and then they started proselytizing Christianity and they got involved heavily into propagating. This led to dramatic increase in the number of Christians. Today, Christians comprise more than 40% of the Lebanese population but Islam still remains the dominant religion at 54%, Druze at 5.6%, Others at 0.4%. Statistics always speak the truth and the truth is that the big demographic change in Punjab now seems to be imminent.